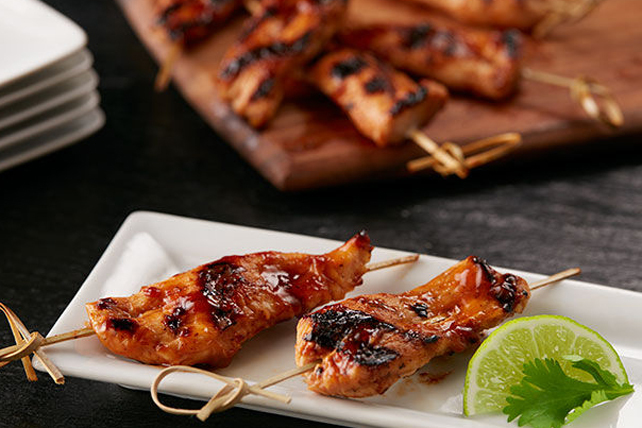 Our Sweet Chili-Chicken Satay recipe is perfect for parties of all kinds. This appetizer is sure to become one of your go-to recipes for easy entertaining. Mix all ingredients except chicken until blended. Pour half the barbecue sauce mixture over chicken in shallow dish; turn to evenly coat all chicken strips. Refrigerate 30 min. to marinate. Drain chicken; discard marinade. Thread 1 chicken strip onto each of 24 small skewers. Grill 4 to 5 min. on each side or until chicken is done, brushing occasionally with remaining barbecue sauce mixture. If using wooden skewers, soak them in water for 1 hour before using to prevent them from burning on the barbecue. Sprinkle with toasted sesame seed before serving.